Franklin and Luna are back again and this time it's Franklin's birthday! Luna and all the villagers are planning a surprise party. While the party is being set up, Luna takes Franklin book shopping, and Luna's tortoise, Neil, finds a padlocked book of fairy tales and can't help picking the lock. But when he peers inside, the book swallows him whole! Franklin and Luna dive into the book to rescue Neil and tumble into a cobwebbed forest where they meet dusty fairy-tale characters who have been trapped inside the pages for hundreds of years. 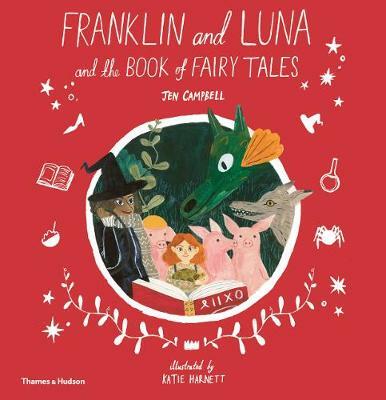 In this new Franklin and Luna adventure, the adorable duo meet three pig architects, a wolf with a New Age attitude, and a very bored princess. Desperate to be brought to life, these fairy-tale characters join Franklin and Luna on their hunt for Neil, realizing that the only way to escape the book is to trek all the way through it. Find out if Franklin and Luna find Neil and make it back in time for Franklin's party in this exciting, new, picture-book adventure.